Positioned at the pinnacle of our 6×36 stainless steel wire rope range, this 52mm diameter product is built for heavy duty load bearing thanks to its 154 tonne capacity and versatile construction. From use in maritime rigging to deployment as a decorative architectural feature, this 52mm 6×36 Stainless Steel Wire Rope can do it all. This type of stainless steel rope is able to withstand fatigue and the rigours of regular usage, while also offering exceptional corrosion resistance. There are other constructions of stainless steel rope available, including 1×19 and 18×7 rope. 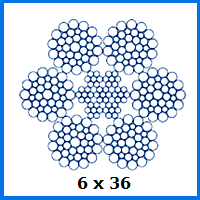 However, thanks to the diameter and design of this 6×36 rope, it is better suited to the kinds of heavy duty tasks that you may need to complete. The outer layer of wire bundles are formed around an inner core which can either be made from more steel wires or a fibre alternative. A steel core delivers an improved WLL of 154,059kg and a breaking force of 1,511kN. It is heavier than the fibre core iteration, which sacrifices a little capacity for improved flexibility. Take things further by adding ferrules, terminals and other fittings to your stainless steel wire rope assembly and allow our engineers to carry out the installation for you, making life much simpler. If you are confused about any of our wire rope products, please do not hesitate to contact Rope Service Direct. Our team can be reached on 01384 78004 or via email. 52mm 6x36 Stainless Steel Wire Rope Overall rating: 5 out of 5 based on 6 reviews.